Ralph’s Radio in Vancouver and Victoria has been selling and installed navigation systems in vehicles since these products first came out in the 1990s. As time has gone on, more and more people use navigation systems to find restaurants, businesses or vacation spots. You could even say that physical maps are a thing of the past for many people. In more-recent years, folks have started using the free navigation apps on their smartphones. Does an installed navigation system still have a place in a modern vehicle? Absolutely! Follow along as we explore the benefits of an installed navigation system. The single biggest benefit of an installed navigation system from Ralph’s Radio is the quality of the mapping software. It is more accurate. Almost everyone has experienced using the free GPS on a cellphone, only to hear it say, “You have arrived at your destination” when you actually have not arrived. You get frustrated, maybe even panicky as you try to find the the place you are trying to get to. Our installed navigation systems use higher-quality mapping software that will help you reach your destination correctly the first time. Another benefit of an installed system is the integration with your car audio system. You never have to worry about hearing a voice prompt because our systems will mute the music, announce the next turn and then return the volume to the original level. You will follow along much better and be more at ease. When you are driving along the road and glancing down at your phone, wouldn’t it be nice if the screen was larger and it was high up in the dash instead of sitting in a cupholder? Our systems use bright, vibrant displays that are high up in the dash and easy to see at a glance. When you are driving along, an installed navigation system uses an external GPS antenna that is better at picking up the satellites in the sky than a phone sitting in your vehicle. That means you have more-accurate placement of your car, truck or SUV on the map. It allows you to make better decisions when driving on congested city streets. Two of the best ways to safely use your iPhone or Android phone while driving are Apple CarPlay and Google’s Android Auto. Many of our installed systems offer this incredible technology, which allows you to call, text, play music, use GPS, and even set and see reminders, all via voice control. 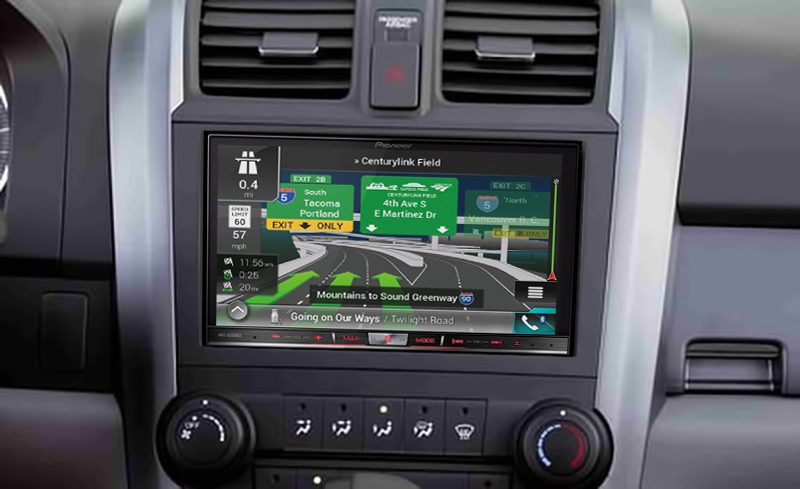 If you like this technology but don’t feel the need for an installed navigation system, we offer solutions that are based on these two technologies by themselves. Do you have a vehicle with some age that you love, but wish it had the technology of a new one? You are in luck. Ralph’s can add everything from Bluetooth to satellite radio, backup cameras, blind spot systems and upgraded audio, along with your new navigation system. We can give you a technology makeover! The best way to experience an installed navigation system is to drive to Ralph’s Radio for yourself. One of our highly trained experts will look over your vehicle, get to know you better and help find the best solution for your needs. Let us show you why more and more people choose us for their mobile electronics needs every year. You can also contact us about any of our products and services by clicking HERE.